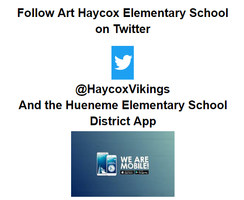 Now you can follow us on the Hueneme App and Twitter. Follow us on Twitter @HaycoxVikings . If you download the Hueneme app, make sure you select Art Haycox Elementary as one of your schools under the settings menu. We look forward to connecting with you and keeping you informed. Los martes los estudiantes salen temprano. Por favor asegurese de recordarle a sus hijos, y favor de recogerlos a tiempo.Tuesday is our early dismissal day. Please make sure to remind your child, and pick them up as promptly as possible.